Johannesburg - Winning just one out of four World Cup qualifiers is not a good return of investment, but Bafana coach Stuart Baxter has refused to be drawn on what this could mean for his future. After failing to qualify for yet another World Cup, Baxter says he will not quit his position. 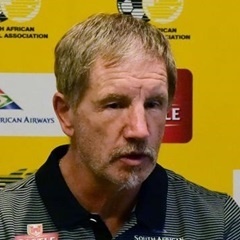 Baxter has missed out on a chance to lead Bafana to next year’s football spectacle in Russia following their 2-0 defeat to Senegal on Friday night, killing their slim hope of sneaking through. This was Bafana’s third loss in the campaign after twice going down to Cape Verde. They are at the bottom of the group and, while Senegal is off to the World Cup, Bafana are once again going back to the proverbial drawing board. This is the second time Baxter has failed to qualify for a World Cup. He was also in charge when Bafana failed to make the 2006 event in Germany. But the Englishman put on a brave face on Friday night, saying he was not going to walk away from the team. “I’m hearing already what I’m gonna do now, walk away. I have been in the job for about 220 days and only 40 days in camp with the players. I’m not going to hang myself or fall on my sword because we didn’t qualify. That would be absolute lunacy,” said Baxter. The visibly upset coach said his mandate wasn’t to qualify for next year’s event, saying he did not have a written directive to qualify for the World Cup. “I don’t think I have a written one in my contract. My aim was to try to qualify for the World Cup and Afcon in 2019. No one said, ‘if not, pack up and go’. But, as a professional, I know if I have a nightmare in both I will go. They don’t have to chase me". He said a lot had not changed in South African football and that it was about time things were done differently. “There is a saying that if you do what you have done, you always get what you always got. I don’t think we have changed our mentality at all since the time I was here before. I hope we can have more cooperation between the Premier Soccer League [PSL] and the SA Football Association". He said the time had arrived for the authorities to take development seriously. He also said it was a good sign that the PSL was more attractive and competitive. “As the PSL gets more competitive and attractive, players don’t have to go abroad – that’s good for the league, but I think we have got to talk about development programmes and how we develop our players. We will probably end up in the same boat in four years’ time. I don’t think we have done anything differently since the last time I was here". Baxter said Bafana lost the plot in the two games against Cape Verde in September, and it was always going to be difficult to bounce back from those defeats. “I think the Cape Verde results destroyed the campaign. It is the same Mauritania syndrome in that we underestimate small countries. These are games we expected to win, but we didn’t". Needing an outright victory to keep their hopes alive in the campaign, Bafana were undone by a Diafra Sakho’s early goal in the 13th minute. Then Thamsanqa Mkhize compounded their problems with an own goal to give the visitors a 2-0 victory. Baxter said there were some positives in some aspects of the game, but that there was still a long way to go. What do we need to do to improve Bafana Bafana’s performance?